In an article "For Japan, a Long, Slow Slide," the Washington Post tried to explain Japan's current economic difficulties. Japan's spectacular flush of manufacturing wealth after World War II was, in many ways, "lucky," said Matsumoto, the investment company executive, who is a student of Japanese economic history. "The government took a huge bet on a few strategic industries -- like steel and automobiles -- and it worked," he said. "It took our economy up to second place in the world. It is totally abnormal for a country with 127 million people." The Post doesn't seem to realize that they hit the nail on the head when they spoke of the "insidious petering out ... of political will to stop the slippage." I grew up in Japan after WW II and I saw first-hand how the Japanese worked the "miracle of manufacturing" cited by the Post. The Japanese were incensed, embarrassed, and frightened when Commodore Perry sailed into Tokyo Bay and made them open their shores to foreigners at cannon point. The more enlightened leaders realized that they'd be dismembered like the Chinese unless they got their hands on the means to resist quickly. They founded industries by using giveaways, concentrating on the one irreducible social necessity -- manufacturing armaments to hold the round-eyed barbarians at bay. The Japanese military-industrial complex did rather well for years. They defeated the Russians in 1904-1905, then took over major portions of Asia in order to get control of the raw materials they needed. This exercise in vertical integration of their manufacturing operations ended abruptly in 1945 with the country bombed flat. Their industries were wiped out and they started over. The motto for the 1950's was "Steel Builds the National House." Once they got steel costs down, they became competitive in shipbuilding and later in automobiles. Japan spent 30 years from 1950 until 1980 rebuilding their industry. The generation that had survived the American bombing and spent a few years after the war wondering where the next meal was coming from realized that they all had to hang together to survive. Everybody cut personal consumption to the bare minimum. It was said that an American city threw away enough to feed a European city; a European city threw away enough to feed a Japanese city; what a Japanese city threw away would feed an ant hill if the ants really hustled. Workers saved most of their pay and made it available for investment in new factories. The government ministries concentrated on making foreign exchange available to favored industries which had a good possibility of earning back more foreign exchange. Their success was not at all a matter of "luck" as Matusmoto believes, their success was a product of unselfish, cooperative, hard work. The Post said, "Fifteen years ago, Japan ranked fourth among the world's countries in gross domestic product per capita." All good things come to an end, however, in that prosperity carries with it the seeds of its own downfall. Jewish history tells how the nation of Israel went through a repeated cycle of fighting for freedom, getting soft over a period of 40-60 years, being conquered, and having to fight their way back to freedom again. Ancient Jewish records describe a Middle Eastern version of what we at Scragged call the Confucian Cycle; the Jews might call it the "Joshua Cycle." The most poignant phrase in the account of Israel's Joshua Cycle is, "And also all that generation were gathered unto their fathers; and there arose another generation after them," As the men and women who understand how they'd fought for their freedom died off, the next generations forgot to sacrifice and let themselves be conquered. So it was with Japan. The generation who personally experienced starvation died or retired; their successors decided they might as well take it easy and work only 60 hours per week instead of 80. As a Japanese friend told me, "By the mid-seventies, the country was doing pretty well. My friends in government decided that the country was OK and they ought to look out for what was best for their agencies. By the mid-eighties, the agencies were doing well, so they decided to look out for themselves." Confucius' #4 rule for a smooth-running society is that government must look out for the welfare of the people. Without an Emperor to chop their heads off, there was nothing to keep Japanese mandarins from feathering their nests. In saying that government had to look out for the welfare of the people, Confucius spoke of attitude and example, not competence or effectiveness. Many Americans downplay the role of government in the Japanese economic miracle, pointing out quite rightly that most of the vaunted Japanese government initiatives didn't really work. They've missed Confucius' point -- by sincerely trying to benefit the nation, government officials set an example of hard work, self-sacrifice, and looking out for others. This has nothing to do with culture or religion; it's based in human nature. Management gurus teach that effective leaders lead by example; that's what the Japanese government did. With their hard-working, unselfish, top-down example in front of them, ordinary Japanese worked hard and pulled their nation out of the ashes of WW II. When government employees stopped setting the beat, the Japanese lost the rhythm and their economy fell apart. When the Japanese people followed their government in thinking they had it made - when the Japanese people decided to look out for #1 instead of trying to build their country - it all came unglued, and down they went. As the Post says, they lack the administrative will to go back to their hard-working former days. They could shut down all the under-performing banks and businesses to put their economy back on track, but that would inflict too much pain on too many well-connected people; they're stuck at bureaucratic top dead center. The only way out, per Confucius, is a collapse which resets the bureaucracy back to zero and makes the entire nation poor again. They'll have to start over, and with the bureaucracy gone, they'll be able to. 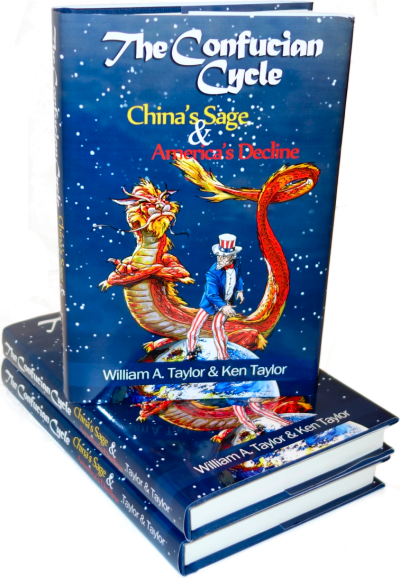 The American rendering of the Confucian Cycle is, "Shirt sleeves to shirt sleeves, three generations." The Japanese are right on schedule. Did you actually make up the term Confucian Cycle? I searched for that online but only came up with your other article. As far as we know, the phrase is original with scragged, but we believe that the phrase would be recognized by any sinologist. Do you think it applies to the US today? I've been in Tokyo twice and never seen the sort of political depression you are describing. How long would you estimate Japan has to fix the problem or are they fixable?